A while back, perhaps around the time that ios 7 or 8 came out, Apple added the ability to split the keyboard for iPads. If I remember correctly, the feature was developed for users who wanted to use thumb typing on larger displays. I’ve never had an occasion to use the split keyboard. Probably because I can’t/don’t and won’t ever become a proficient thumb typist! Yet, every once in a while, I do something inadvertently which results in my accidentally splitting the keyboard and sometimes undocking it too*. I’m always really annoyed when this happens because I don’t remember how to fix it. I just remember that the solution is a quick and easy one…but not specifically, what that solution might be! Surprise! I split the keyboard again! Ultimately finding the solution took me approximately 20 minutes. But that was only because I managed to remain focused and actually did stop reading when I found the solution! This plan could easily have gone awry and distracted me for a much longer period of time**. Because, as it turns out, right now (due to the newness of ios 9) current articles with highlights of 9’s features are plentiful, enlightening and engaging! The screenshot above demonstrates my problem (the one I encountered today). 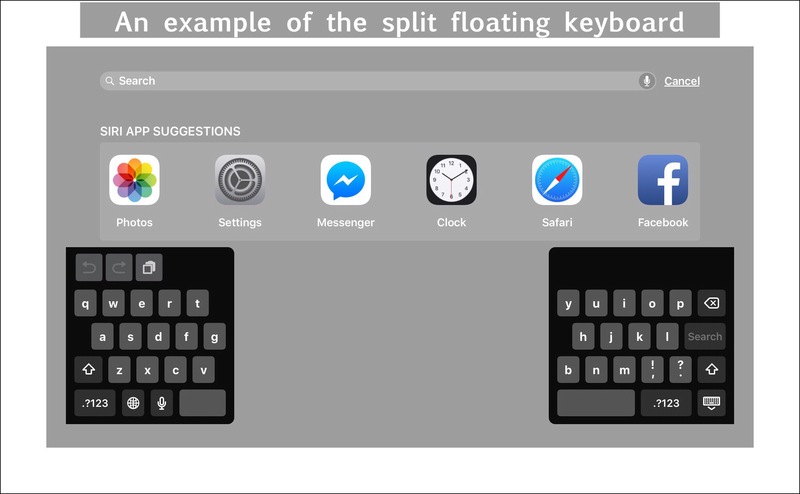 The ones below depict the solution for ‘unsplitting‘ the keyboard. They also demonstrate how to ‘redock‘ the keyboard (i.e. locking it to the bottom of the screen) if you suddenly discover that the keyboard has begun to float! 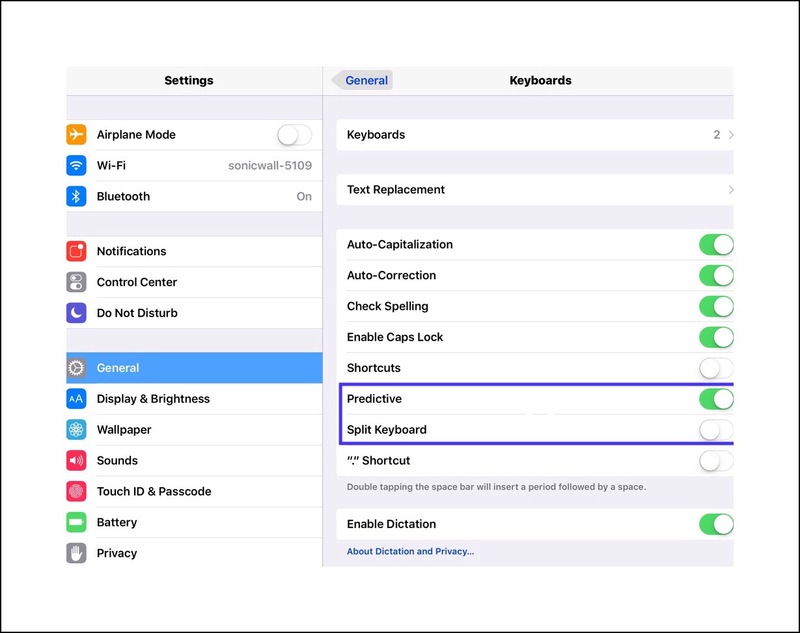 If you never want to risk having the keyboard become split, you can also turn this feature completely off in ios 9 settings. Go to Settings – General – Keyboard to turn this off…see screenshot below. *The solution above helped me to figure out what might be doing to cause the ‘splitting’ of the keyboard. While I’m still not completely sure, I suspect that I’m either not tapping the ‘keyboard’ key quickly enough sometimes (maybe if I’m distracted and thinking about something?) Or I might be swiping up from the bottom of the screen to reveal the Control Panel while the keyboard is displayed, but my swipe is a little off center and I swipe on the keyboard key instead. **Anyone who doesn’t experience symptoms of ADHD might not really get how just a few small occurrences like this can cumulatively wipe out an entire day’s productivity! I thought the fact that I’d just taken my daily dose of Ritalin saved me but then realized as I wrote this, that my subsequent decision to actually write this post for myself had the exact same negative impact upon productivity! This entry was posted in ios, ios 9, ios 9 Quick Tips, iPad, iPhone, Tech Tips and tagged ios 9, ios 9 Tips, iPad, iPad keyboard, iPhone, keyboard split. Bookmark the permalink.